This just in from Ars Technica, "Claire McCaskill, the Democratic senator from Missouri, says police departments nationwide should require their officers wear body cameras in order to qualify for the hundreds of millions of dollars in federal funding they receive each year." You read that right, the Senator wants to tie federal money that police agencies currently receive to compliance with this proposed nationwide body-worn video mandate. "The lawmaker did not offer legislation to support her words. McCaskill, however, is not alone in her thinking. Last week, an online petition asking the White House to require all police departments to wear lapel cameras hit 100,000 signatures. The President Barack Obama administration has promised to publicly address petitions reaching 100,000 signatures." The movement to get agencies to adopt body-worn video recorders is not new. Many agencies have declined to purchase recorders due to the high purchase price and the cost of maintenance, as well as the cost of storing / distributing the recorded footage. But, linking the issue to existing federal funding puts a new twist on the story. Stay tuned. If you're in the NYC area, the Benjamin N. Cardozo School of Law will play host on Sept. 10th to the WSF's Science of Justice discussion/presentation. They use the events in Ferguson to put the spotlight on "forensics," but miss an important point: none of the presenters are experts in digital video or small device forensics. It's a given, these days, that there will be two elements to every crime scene - CCTV and mobile phones. 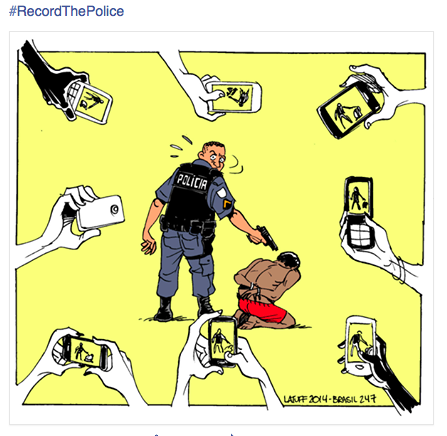 People use their phones to record video of traffic stops and other police activity. Traffic stops take place in front of stores and other places with CCTV. Thus, these images become a vital "silent witness" for the investigation. Yet, this presentation does not feature this valuable piece of evidence, nor any practitioners of this type of analysis. That's unfortunate. Still again, if you're in the area, it should be an interesting discussion. The online site, bellingcat, recently announced results from their crowdsourced investigation into the location of the Islamic State's training site in Iraq. It's an interesting study in the use of publicly available sources to identify the location depicted in photos through visual content analysis, as opposed to relying on metadata. 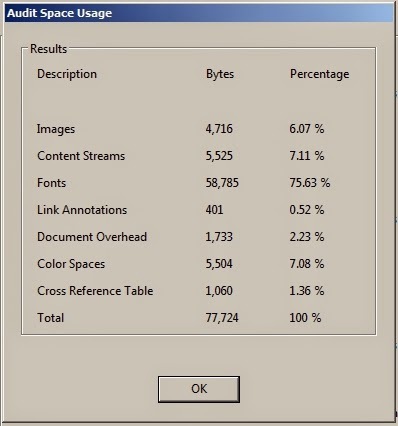 How do you determine the dpi on a photo in a PDF document? 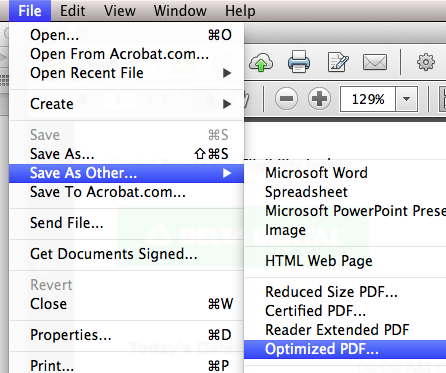 Many folks use Adobe's Acrobat to share reports, images, and video. 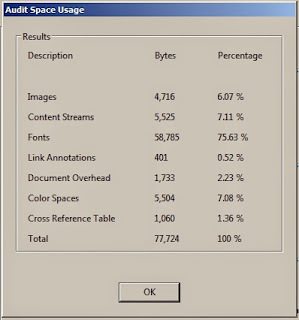 Often times, we're asked to extract the images from a PDF file for use elsewhere. Depending on the downsampling settings, the images in a PDF might not work well outside of the document. Here's how to check the resolution of the image within the PDF file. 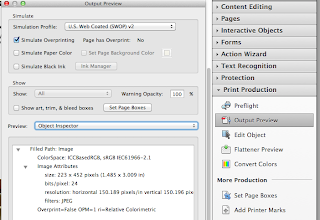 If you have Acrobat Pro, you can use the Object Inspector in Output Preview to see the resolution of an image. 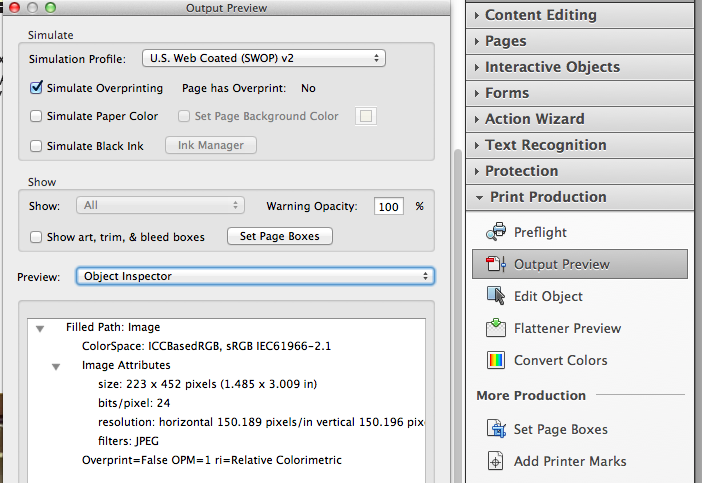 Select View>Tools>Print Production>Output Preview, then change the Preview Type to Object Inspector and click on the image in question. Here's what you'll see. 223x452 @ 150 is like one of those old wallet photos we used to get with our school picture packages. It's not big. Some serious up-sizing will be needed if you want to use this image in a courtroom display. I hope you're ready to retrieve DME from another type of recorder. GM recently announced that the new Corvette will feature on-board video/data recording as part of a performance data recorder and navigation system package that is a $1,795 add-on to the $53,995 base price of the Corvette. In the future, when investigation a burglary/theft from a motor vehicle, or a vehicle theft, you may be asked to download this data / video from the car. "The system was developed with Cosworth, the British motorsports-engineering company that supplies the Corvette Racing team’s data and telemetry systems. It has a SD-card slot in the glove box – which locks on Valet Mode -- for recording and transferring video and vehicle data. An 8-gigabyte card can record approximately 200 minutes of driving time." It looks like the owner will have to have the data card in the slot to record. So our job is easy, just swap out the cards. New in Adobe Camera Raw is the ability to activate LAB Color readouts in the Histogram. 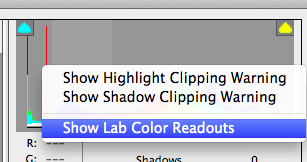 Simply Control-click (Mac) | Right-click (Win) within the Histogram to enable LAB Color readouts, even when the Workflow Options are set to another color space (such as Adobe RGB). I know it's a bit nerdy, but more options are always cool. 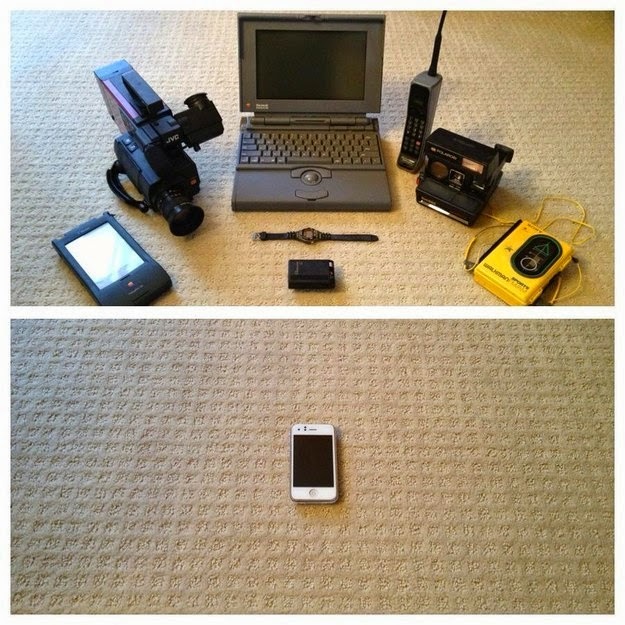 If you started your LE career in 1994, the tech world has changed dramatically. All of your tech was in separate devices. Video cameras were just video cameras. Tablets were just tablets. Etc. Now, it's all in your phone - or your suspect's phone. Just 10 years ago, you found storage devices containing around 128mb. Now, you're finding them to be 128gb - and bigger. How are you and your agency dealing with the blistering pace of this change. Does your agency's SOP's reflect the changes to technology and society? Do your evidence storage / sharing protocols reflect these massive increases in size? Does your current vendor have the products you'll need to take you into the next few years? But, for now, how do you share the 64gb bin file from your latest iPhone dump? If you're not asking these questions, you're already far behind. One of the many vendors making a big splash at this year's NaTIA conference is MediaSolv. 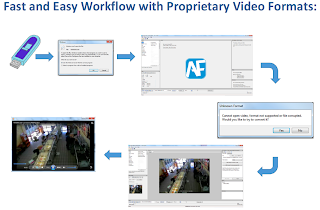 MediaSolv has teamed up with Amped Software to introduce it's First Responder product. 2. Because the format is proprietary, it cannot be played with Windows Media Player and Windows does not recognize the file. 4. When you import the video (drag & drop, or Video Loader filter), if First Responder does not recognize the format, you then have the option to convert the video to a standard format. 5. Convert the video, then you can play it in the First Responder Player. 6. If you aren't a MediaSolv Commander user, you can then export the video using the Video Writer Filter to a format standardized by your agency for play in Window Media Player or any other standard player. 7. If you are a Commander user, export to MediaSolv Commander along with other evidence items. First Responder is designed around Amped FIVE's innovative fast workflow and real-time filter concept to dramatically reduce the time required to process data and improves the success rate of various cases. First Responder will run on standard desktop or notebook computers and does not rely on third party commercial photo or video editing software, plug-ins, scripts, or special hardware. This makes the total cost of ownership much more manageable and is just one platform to learn, maintain, and deploy on hardware you already own. So, if you're in San Diego for the NaTIA conference, stop by the MediaSolv booth and check out First Responder. If you can't make it, send them a note requesting more information.